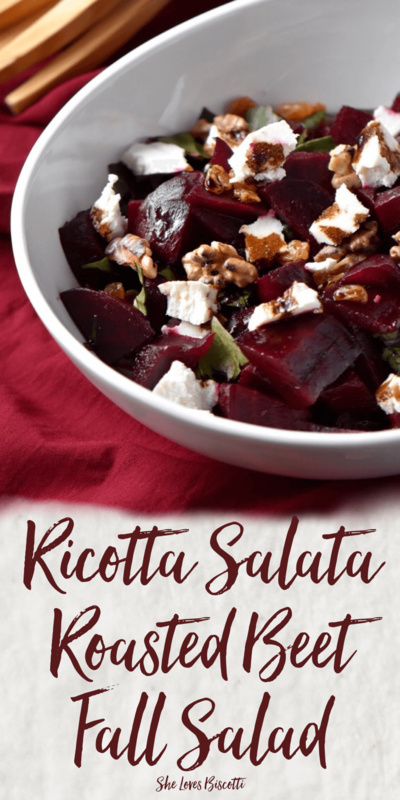 Drizzling a little balsamic reduction on this simple Ricotta Salata Roasted Beet Fall Salad will elevate this colorful side dish into a taste sensation. It’s easy to associate salads with warmer temperatures. They are so light and refreshing, and let’s face it, who wants to turn on the stove in the summer? But rest assured, some salads definitely deserve a place in the colder months, too, and this is one of them. Once fall rolls around, it’s all about comfort food, and for me, beets so strongly belong to that. It’s so hard not to include beets when planning for those hearty stews and soups. At least I’m not alone in my fascination with beets! Just look at what Nicoletta over at SugarLoveSpices made with beets. How can anyone resist that bright vibrant color? 1-Roasting the beets: Did you know that roasting beets intensifies the sweetness and flavor of this root vegetable? 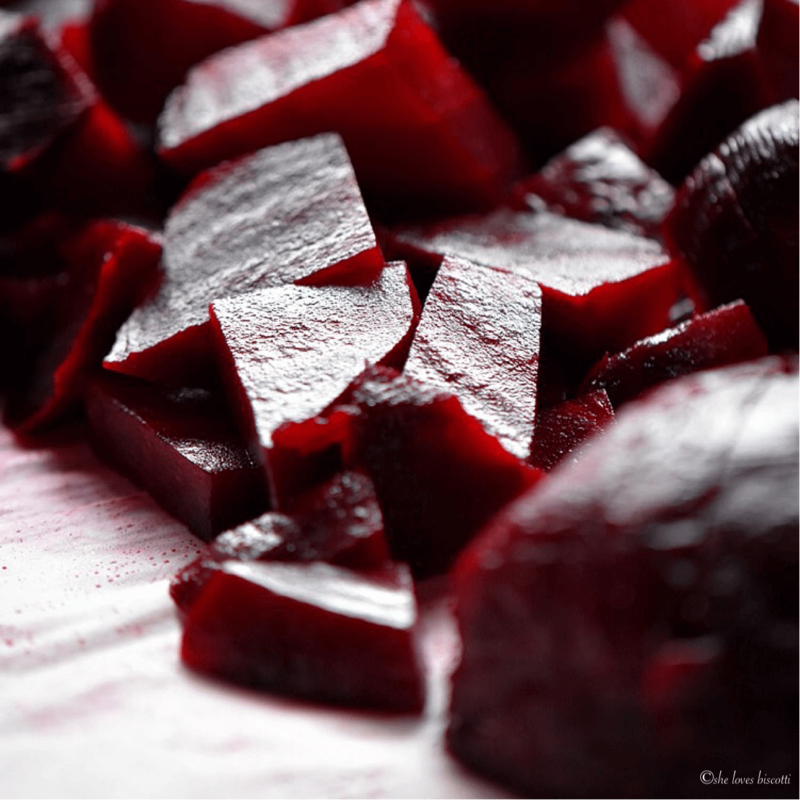 If you are not fond of beets, roasting them might just be your ticket! You will need about 3 medium beets for this recipe. 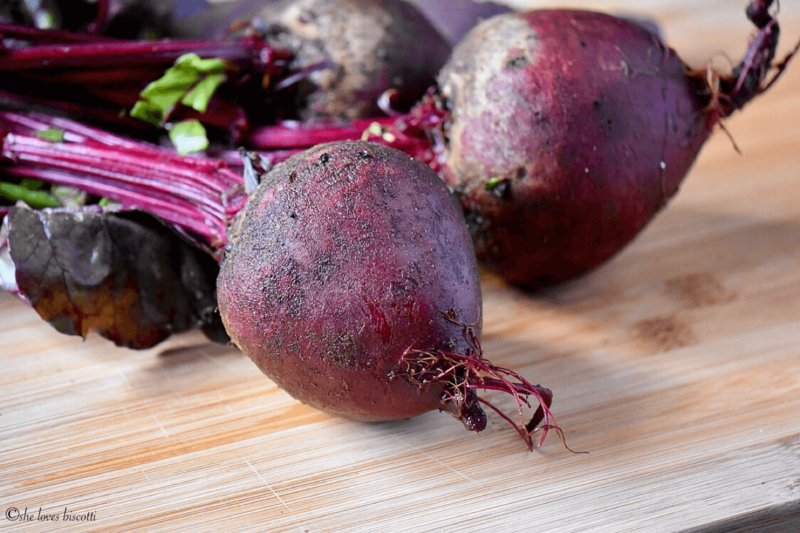 Cut the tops from the beets and give your beet roots a quick scrub. Once the beets are ready, I will drizzle them with extra virgin olive oil and place them (alongside a sprig of rosemary) in a makeshift aluminum foil package, ensuring enough room for the steam to build up. Recently, I attended a Food Bloggers Conference in Ottawa (a few years ago, the conference was held in Montreal -you can read about my experience here). This is my third such conference and I must say they are always well planned and organised. As a food blogger participating at such an event, I received a swag bag. One of the items that was in my bag was a Cookina reusable cooking bag. Well, I just had to try roasting beets with it. So, I roasted one of the beets in this Cookina bag (not sponsored); and the other two beets in aluminum foil. The beet I cooked in the Cookina bag took about thirty minutes less to roast (if you recall, I used their barbeque sheet (not sponsored) when I made this Grilled Polenta… perfect grill marks everytime)! Ok, so once the beets have cooled off, the skin can easily be removed. 2-Making a balsamic reduction: This is definitely a game changer and so easy to do. Essentially, combine a simple balsamic vinegar and honey. Allow to simmer until it is reduced almost to a syrup consistency. You won’t believe how intense the flavor becomes. 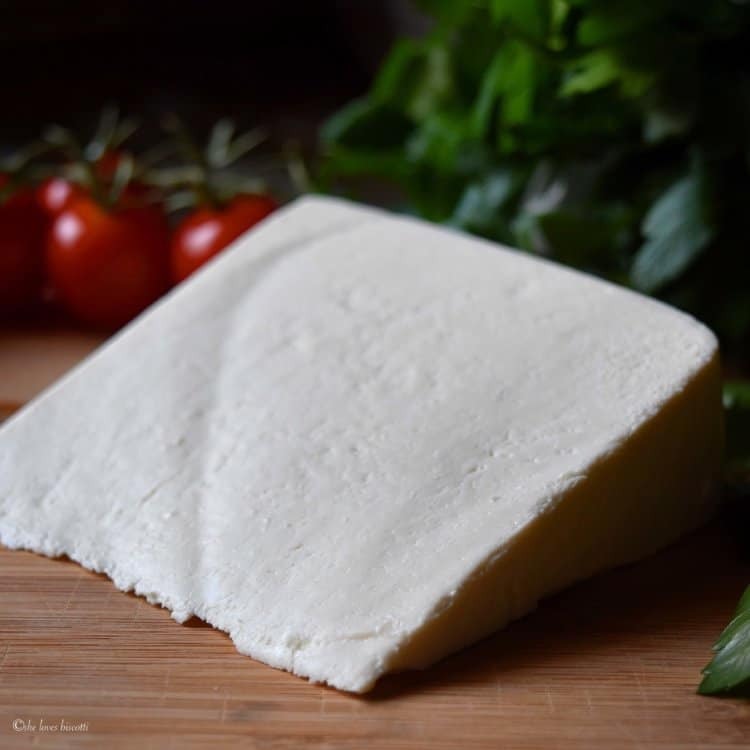 3-Ricotta Salata: This is an aged, pressed cheese whose final product has a crumbly, yet firm texture, with a salty, almost tangy flavor. It is perfect to use in this salad as it complements the bitterness from the beet greens perfectly. If you cannot find this cheese, feta is a great alternative (if you are interested, I have used ricotta salata in this recipe for Best Italian Chopped Salad Greens and in this refreshing Basil Balsamic Ricotta Salata Grilled Watermelon). 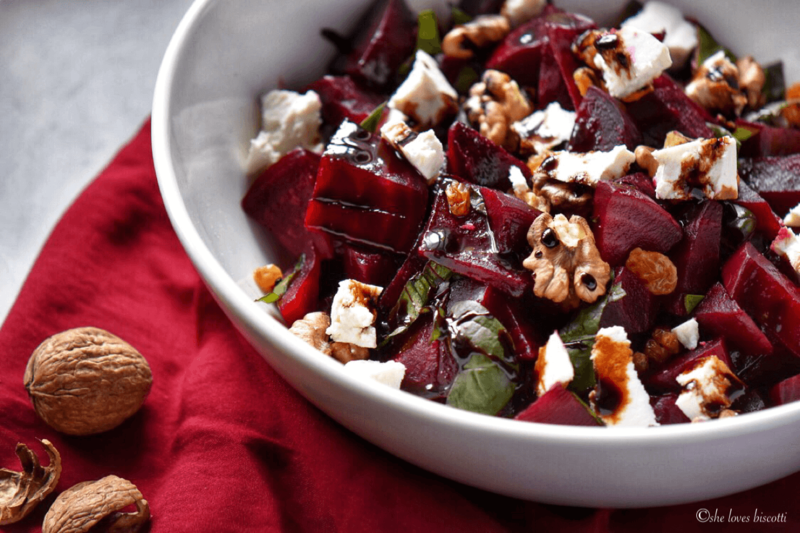 Needless to say, the combination of roasted beets topped with ricotta salata, toasted walnuts and drizzled with a balsamic reduction is a guaranteed winner. A few years ago, I bought a magazine called Cook’s Secrets, this is one of the fantastic recipes I found in this journal. Over the years, I have made this salad with different nuts and cheeses, but there is nothing better than Ricotta Salata in my books. Hope you get a chance to try this wonderful salad! Cut the tops from the beets and set aside as we will be using them in our salad. Scrub the beetroot well. Place beetroots and rosemary sprigs at the center of a large piece of aluminum foil. Drizzle olive oil on beets. Wrap the beets with foil, allowing space for steam to build up. Alternatively, can wrap up each beet individually. Roast the beets for about 1 hour or until they can easily be pierced with a knife. Carefully unwrap the beets and discard the rosemary. When cool enough to handle, remove the skins. Cut the beets in quarters and set aside. Combine the balsamic vinegar and honey in a small saucepan. Bring to a boil and then simmer, uncovered, until reduced to about 1/4 of a cup. Note that this reduction will thicken as it cools. 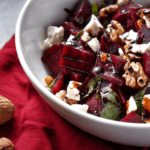 In a bowl, toss the beetroots with the beet greens; add remainder 2 tablespoons of olive oil. Season with salt and pepper. Transfer to serving dish. 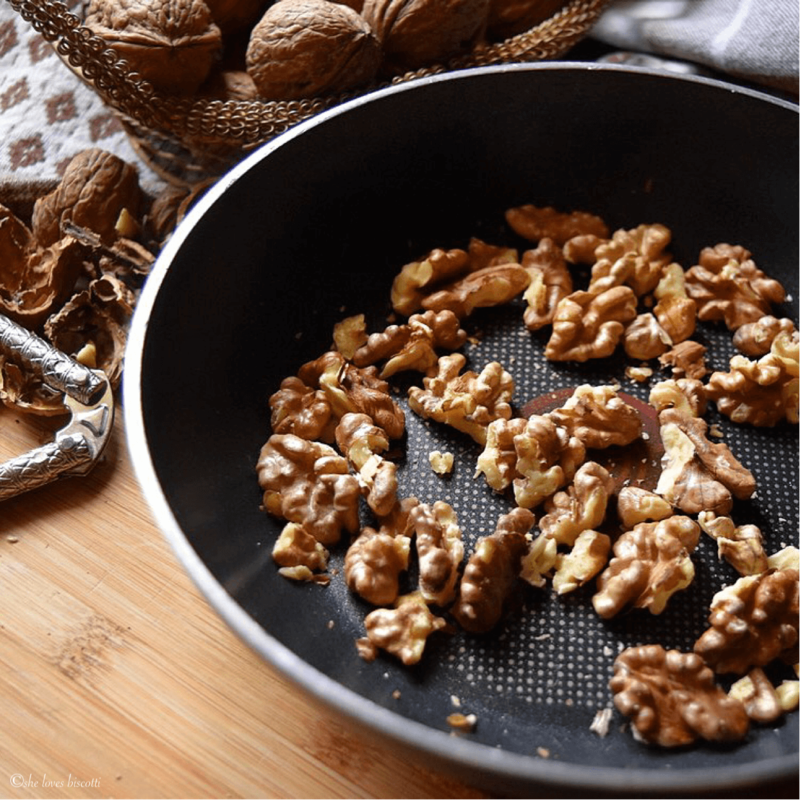 Sprinkle with golden raisins, walnuts and ricotta salata. Drizzle with balsamic reduction. If you do not like beet greens, you can substitute with other greens such as kale or mesclum. LOVE THIS POST? PIN IT TO YOUR SALAD BOARD! Made this salad for a potluck lunch, and it was an instant smash. Thanks Maria! I often roast beets but have never added rosemary to the mix, what a wonderful way to capture the fall flavors. 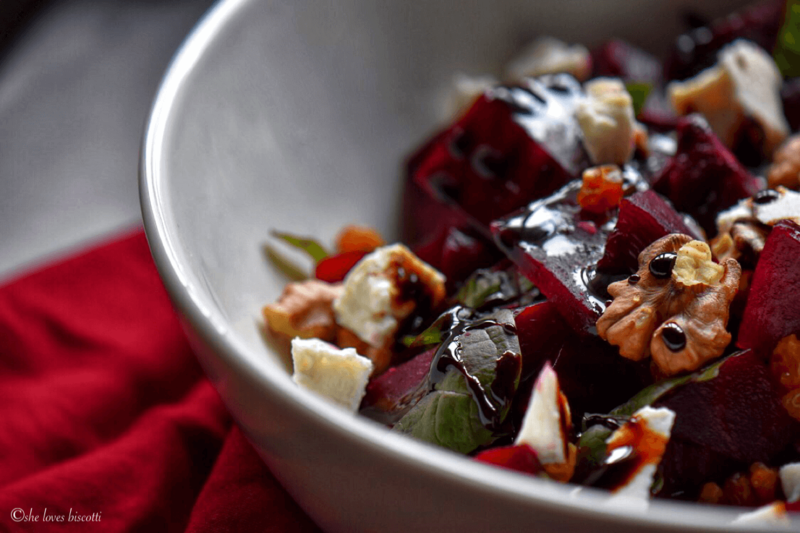 Your photos are simply brilliant, capturing the colors, textures and flavors of this beautifully prepared beet salad. You are so right, roasting the beets brings the sweetness out and they taste amazing! Plus, pairing them with ricotta salata (one of my favorite cheeses as well! ), walnuts and balsamic reduction, a touch of honey and few raisins, wow, what a gorgeous Fall salad! Thank you for the mention and for always posting great recipes! This looks incredible! I really love the combination of flavours and textures. A winner for sure! And thanks for the tip about roasting. I love beets but my sweetheart does not. Perhaps he needs to try them roasted! What a beautiful salad! I have beets in my fridge right now and must try this! Thank you for following my blog. I enjoy reading yours.